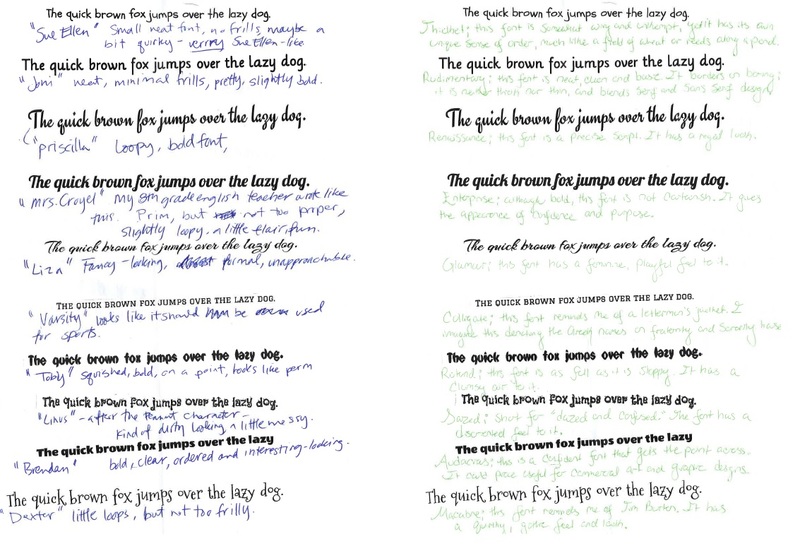 I wanted to see how they viewed font compared to each other and compared to myself and the creator of the fonts. I should apologize now for the green ink, I don’t know what Person B was thinking. Here are the real names of the fonts. All fonts were from Google and yes, they are all free! What I loved about each person descriptions was how unified each person’s was. Person A used all NAMES while Person B used all ADJECTIVES. I happen to directly know some of Person A’s people of which she named the fonts after ‘Dexter’ or Mountains of Christmas is her sneaky beagle and ‘Brendan’ or Wendy One the ECON professor. She also used pop-culture references from Charlie Brown. I was amazed by her characters of each font and how for her, it directly related to a person in her life. Person B on the the other hand used terms and definitions almost for her font names and descriptions. She also happens to work in PR & Marketing at the College while the other is an Administrative Assistant. For both of their names for ‘Graduate’ they were spot on. Person A deemed it Varsity and Person B deemed it Collegiate. I really want to show each person what the other said about the font so that they can see if each others relates at all. Is Person A’s people match the descriptions Person B gave? It is amazing to see semiotics at use and the amount of detail and emotion a font can convey to different people. It is all perspective, and we all have a different one to use in learning.